The memory card on my camera filled up just as I was saying "good girl!" But see how she snaps to attention? I think she lived with a stern human. At least she learned some manners. The bonnet is actually old news; she managed to weasel her way out of it over the weekend. Her wound has healed enough so I didn't bother putting it back on. Sunday morning I discovered she also chewed the edge of my brand new papasan chair. She's definitely feeling better. Now she's like Tommy when I first got him, with boundless energy I need to help her burn off. While I showered, she started chewing the bottom of the kitchen cabinets. I had to go out to the westside for a few hours so I put her in a crate that I bought for Tommy and never used. She wasn't happy but I didn't want to return to my house in shreds. The adventures continued, but I'm too exhausted to write about them. Soon. Jen Byrne demands a pupdate, so here it is. She's the sweetest girl ever. When I picked her up at the Pasadena Humane Society, her whole body shook with fear. Two hours later she did the pit bull wiggle when I walked into the kitchen. I thought it would take a lot of work to bring her out of her shell, but she made it so easy. Her temperament and manners are exemplary. It makes me wonder whether she's been trained. It certainly seems so. What was her life like before she ended up on the streets? Unfortunately she has an infection from the spay surgery. I have to clean the wound twice a day. She doesn't like it, but she stoically lies still while I do it. She also has a bad case of kennel cough.The vet said her lungs are filled with fluid so I have to be careful she doesn't catch pneumonia. Poor Tommy. Louise has taken over his favorite room in the house, the kitchen. 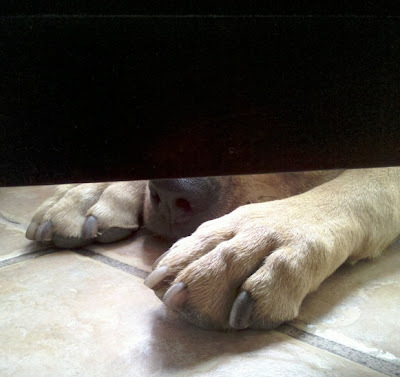 He tries to get a glimpse of the action underneath the barricade. I've been keeping them separate so she can heal and so he doesn't catch her kennel cough. Is it inevitable? 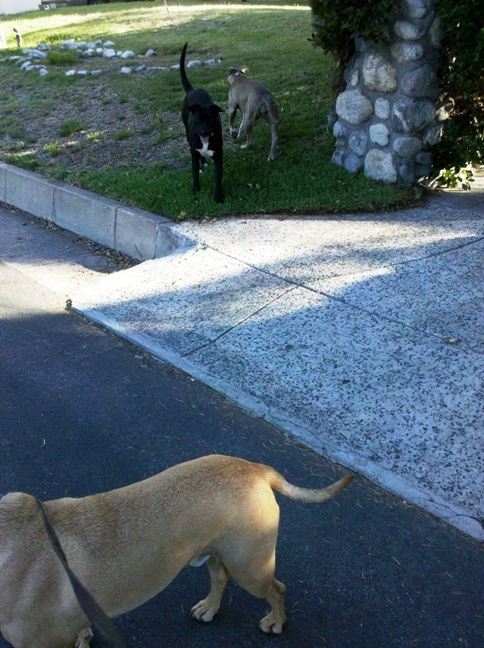 When I first saw Petie, he was dodging LA Animal Services down on Marengo. I stood at the corner with Tommy, hoping he’d come to us, but instead he ran into a backyard, as terrified of Tommy and me as he was of animal control. A few days later I saw Petie in Farnsworth Park. 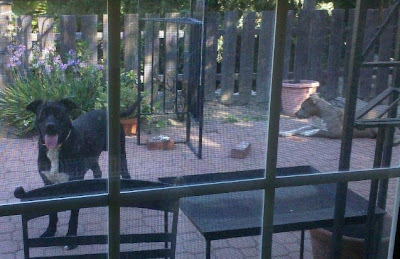 He was still fearful, so I put a bowl of kibble on the ground and stood at a safe distance giving him the space to eat. After he heartily finished the food, we did the same dance with a bowl of water. Once I gained Petie's trust, he blossomed into an entirely different dog—playful, loving, happy. The moment he saw a tennis ball on the ground he pounced on it with a burst of joy, as if he’d discovered a long-lost friend. 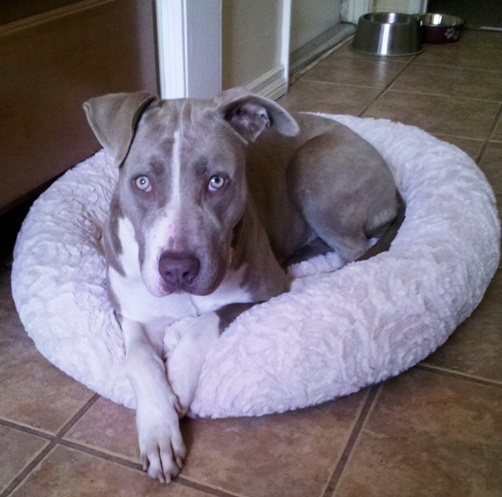 Unfortunately the light-colored pittie’s story is different. She was timid from the start. I only got her into the car because of her attachment to Petie: she just followed his lead. 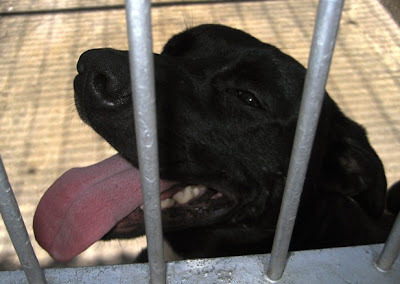 Alone in her kennel at the shelter, she’s been emotionally shut down, unapproachable. No one has been able to lure her out of her shell. The verdict is she isn’t adoptable. The verdict is they have to kill her. Last resort has arrived. So, Friday she gets spayed, and Saturday I pick her up and bring her home. Honestly this is not cause for celebration. I’m not thrilled with this plan. I’m tired. I want to focus on my new house. I want to have friends over for brunch, set up my home office, start a regular writing practice. I want to buy a couch. But I can’t stand the thought of having led her to her death. And perhaps, ultimately, she’ll lighten my burden. 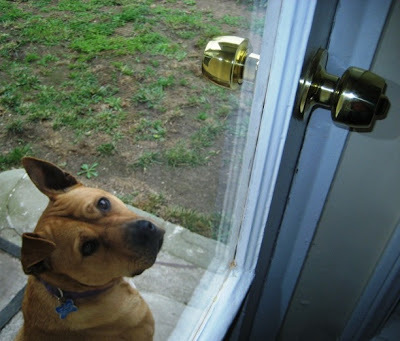 Perhaps Tommy will frolic in the yard with her instead of sitting at the door, pathetically waiting to get back in the house only moments after I've let him out. Perhaps, ultimately, she will again follow Petie's lead, and shine. As Veronica points out, a pit bull shouldn’t have the reserved nature of a lion. This girl needs a new name. Juliette is sweet but her fate is too tragic. My sister, Lynne, detecting a purple hue in the photo, called her Iris. I like Iris. I also like Trixie. Trixie sounds like a sweet goofball, just what I'm hoping her true nature turns out to be. What do you think? What shall we call this gorgeous shy girl? But there’s no time for that now. Now I need to get down to business. The dogs have 5 days to be claimed by an owner. If no one claims them after 5 days they are available for adoption. 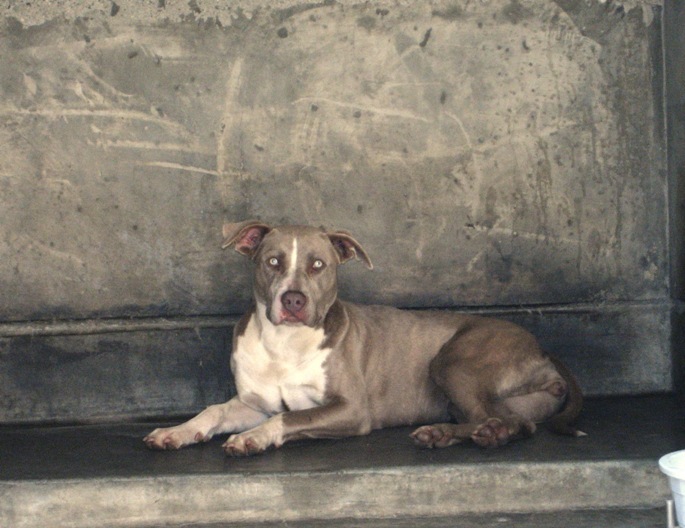 How long will the dogs remain up for adoption before being killed? That depends on 3 things: temperament, health, and how much space is available at the shelter. I didn’t check it. Instead I met with an adoption counselor and I signed up for “last resort” status. This is Petie. He just wants to be one of the gang. Show him a little kindness and he will shower you with love and adoration. This is Elsa. She has the beauty and reserved nature of a lion. Elsa is in love with Petie. (Can you blame her? Look at that face!) I'm in love with both of them.